This is an excellent little chorus pedal from SONICAKE and we named Cloud Chorus. This little pedal floats along on a classic BBD-style analog chorus sound. Capable of producing some very nice chorus variations with full control of Level, Depth, Tone and Speed settings, giving huge flexibility - Cloud Chorus accompaniment to some pretty deep modulation. True Bypass and heavy metal casing. Pure analog and true-bypass circuit, dual-mode designing offering guitarist and keyboardist the ultra-high quality BBD-style chorus effect. SHALLOW mode provides you with a vintage, classic, glassy, crystal Bucket-Brigade style chorus sound. LUSH mode gives you a deeper chorus sound with greater tweakability and wider tonal variation. Basic and straightforward control layout: LEVEL, SPEED, and DEPTH. 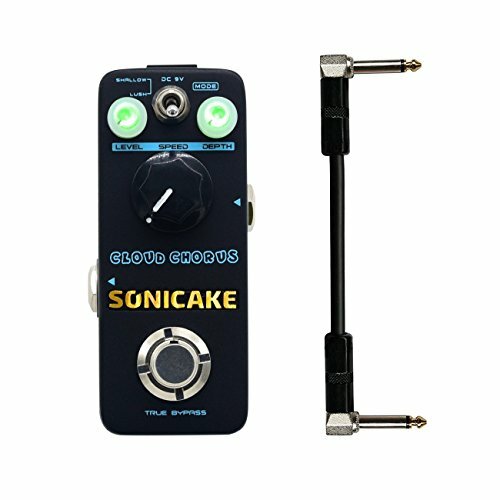 If you have any questions about this product by SONICAKE, contact us by completing and submitting the form below. If you are looking for a specif part number, please include it with your message.